The gospels—Matthew, Mark, Luke, and John—contain the only records of Jesus' baptism in the New Testament. They contain similarities but also some minor differences. These differences may disturb some people, but to Mormons, this seems only proof that their accounts are true instead of collusion. Matthew mentions that Jesus went from Galilee to the Jordan River to be baptized by John the Baptist. Mark is the only other one who mentions Galilee. Luke not only doesn't mention Galilee, he doesn't even mention Jordan. Matthew is the only apostle to mention John's initial refusal to baptize Jesus because of Jesus' worthiness and innocence. To Mormons, Christ's insistence upon being baptized emphasizes the necessity of the ordinance, showing that baptism isn't just necessary to remit sins (which Jesus didn't have) but is necessary to enter God's heavenly kingdom (Celestial Kingdom). Jesus said to John, “Suffer it to be so now; for thus it becometh us to fulfill all righteousness” (Matt. 3:15). This refusal and then insistence parallels Peter's refusal for Christ to wash his feet. (John 13:8). Recognizing the necessity of this ordinance, Joseph Smith made foot washing part of the admission to the school of prophets (D&C 88:140, 141, 124:37-39). Matthew gives the account of the baptism from Jesus' viewpoint, that he was the one who saw the heavens open and the Spirit landing on himself, according to the language of verse 16. Mark's account corroborates this viewpoint ,and Luke's appears to, also. However, John's differs. Matthew reports that “Jesus, when he was baptized, went up straightway out of the water” (3:16), which indicates that he had been submerged under water, or else he couldn't have come up out of it. 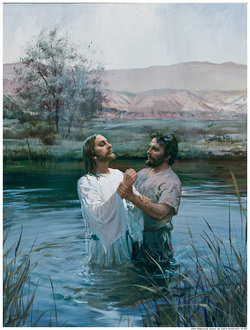 Therefore, Mormons believe that baptism must be done by total submersion, like Christ's baptism. Matthew says that when Jesus was baptized and came out of the water, the heavens opened before him and he (Jesus) saw the Spirit of God descending like a dove and landing on him(self). Like is a word that means similarity. Mormons believe that the Spirit was the Holy Ghost and the similarity was the way the Spirit landed upon Christ—lightly, smoothly—or that a dove descended as a symbol of (similar to) the Holy Ghost. Mormons do not believe that the Holy Ghost (a God in spirit body which looks like a man) would enter a bird's body or appear as a bird. Matthew's account showed the voice from heaven addressing the watchers: “This is my beloved Son, in whom I am well pleased” (3:17). This would indicate his concern that they know that Jesus is divine. Matthew shows three different beings: 1. Jesus in physical form 2. Heavenly Father (a separate person, indicated by a different location; the way he addresses Jesus as his Son, not as part of himself; and separate independent action. 3. The Holy Ghost/Spirit of God (also in a different location with independent action). Mormons believe from this, as well as from other scriptures (such as when the Eternal Father speaks at Jesus' Crucifixion), experiences, and revelations, that the Holy Trinity is composed of three distinct separate individuals, a major doctrinal point. Matthew indicates that immediately after baptism Jesus went to the wilderness for 40 days. Mark mentions that Jesus came not just from Galilee, but specifically from Nazareth. Neither Luke nor John mention Jesus had been in Galilee, and Luke not only doesn't mention Galilee, he doesn't even mention Jordan. Mark also reports Jesus as “straightway coming up out of the water” (1:10)” though neither Luke's short account nor John's mention how he was baptized except at the Jordan, but the implication that it must be done by submersion also comes from the fact it was done in a river, or else anywhere would suffice. Standard English rules would indicate that John (the last person mentioned) would be the one to see the dove descend. Mark reports that the voice from heaven, unlike what Matthew reported, addressed Jesus, not the witnesses, when it said, “Thou art my beloved Son, in whom I am well pleased” (1:11) Nevertheless, the divinity of Jesus was validated. The three separate individuals—the Father, the Son Jesus, and the Holy Ghost--are all in different locations, with different actions, and with different forms. Mark also says that immediately after being baptized, Jesus went to the wilderness for 40 days. Luke's account of Jesus' baptism is short (2 verses) to the point of making it seem less important. He said that Jesus was baptized and the heaven was opened. Again, a voice from heaven came, and Luke says, just as Mark, that it spoke to Jesus instead of the witnesses, saying, "Thou art my beloved Son, in whom I am well pleased” (Luke 3:22). Trinity Three personages are mentioned, supporting Matthew and Mark in their descriptions. Next Luke interrupts to give the reader Jesus' age (about 30) and his genealogy. However, when he returns to Jesus' actions, he corroborates Matthew's and Mark's reports that Jesus went to the wilderness for 40 days. John mentions that John the Baptist is baptizing at the Jordan River (or more specifically, they all mention Jordan, but it's known that that means the Jordan River). However, John fails to mention where Jesus had been. The Apostle John adds some very important details to his account that the other apostles don't report. When John the Baptist sees Jesus coming, he says, “Behold the Lamb of God, which taketh away the sins of the world. This is he of whom I said, After me cometh a man which is preferred before me; for he was before me.” This means that John the Baptist knows Jesus is the Christ. It could be supposed that he had known this before because his mother Elizabeth had known it. However, what John says next creates doubt: “And I knew him not” (1:31). The Apostle John reports that John the Baptist (“And John bare record, saying” 1:32) is the one who sees the “Spirit descending like a dove” (1:32). To summarize, Matthew reports Jesus, Mark reports John the Baptist, Luke doesn't say, and John reports John the Baptist as the one who sees the dove. Perhaps both Jesus and John the Baptist saw the dove, but most certainly at least John the Baptist did, from what the Apostle John further reports. He said that the dove had “abode on [Jesus],” and “he that sent me to baptize with water, the same said unto me, Upon whom thou shalt see the Spirit descending, and remaining on him, the same is he which baptizeth with the Holy Ghost. And I saw, and bare record that this is the Son of God” (1:33-34). Seeing the spirit descend and land on Christ was the sign that revealed Christ as the Messiah to John the Baptist. Three separate individuals appeared in one form or another at Jesus' baptism: God the Father, his Son Jesus Christ, and the Holy Ghost. However, these three personages were united as one in their goal of proclaiming the divinity and calling of Jesus as the Christ, the long-awaited Messiah. John gives an interesting report of the next day after Jesus' baptism, in which John stood with Andrew and another unnamed disciple. When Jesus passed by, John “saith, Behold the Lamb of God!” (1:36)--meaning that Jesus was the Messiah. Promptly the two disciples followed after Jesus and stayed with him until late. Afterward Andrew went to his brother Simon Peter, told him he'd found the Messiah, and took him to Jesus. Then John continues with other happenings without mentioning once the 40 days Jesus spent in the wilderness. The four Gospels tell Mormons these important points of doctrine: !. There are three persons in the Godhead: God the Father, Jesus Christ, and the Holy Ghost. 2. Baptism into Christ's true Church is a necessary ordinance to enter into the Kingdom of God. 3. Baptism must be done by immersion, that is, total submersion in water. 4. Jesus is the Christ, the Messiah and Savior of Mankind (witnessed by The Eternal Father, the Holy Ghost, and John the Baptist). 5. The Holy Ghost may manifest himself by the sign of the dove. This page was last edited on 24 January 2012, at 12:23.